It's been a decade since the Mars Reconnaissance Orbiter turned its sights on the Red Planet, and its history is positively stunning. The Mars Reconnaissance Orbiter is back in the news on its 10th birthday after making a huge discovery down on the Martian surface below — just 100 miles from one of the rovers. As we reported, this newest discovery is of an ancient lake bed that scientists think may have been the last place life existed — if it every did exist — on Mars billions of years ago when the last of the waters dried up and left a vast expanse of chloride that scientists are excited to find. However, the MRO has had a very vigorous history, and perhaps one discovery stands out more than any other. 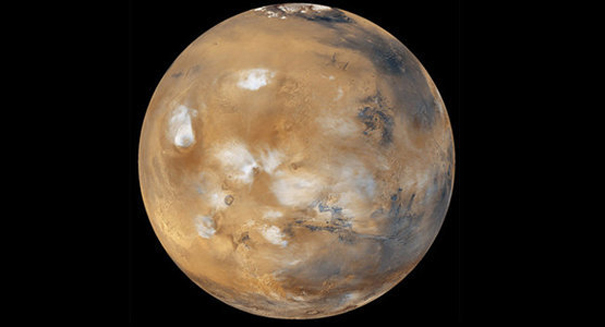 It’s the discovery of ice years ago, not long after it arrived in orbit around the Red Planet, that really put the Mars Reconnaissance Orbiter on the map. Back in 2009, scientists published a study in the journal Science that detailed an amazing new discovery by the Mars Reconnaissance Orbiter: there are some new craters on Mars that have relatively pure water ice, and when they are exposed, the ice fades away. The MRO used its Compact Imaging Spectrometer (CRISM) to locate and observe the ice at five locations. Earlier that year, the MRO had made radar measurements of the north polar ice cap, determining that the water ice is 197,000 cubic miles, which is about the size of 30 percent of the Greenland ice sheet here on Earth. These discoveries could provide future astronauts who colonize Mars with a place to find a fresh water source that could sustain them, making this discovery incredibly important to future missions. The MRO was a $720 million project that was built by Lockheed Martin in partnership with the Jet Propulsion Laboratory. It was launched back in August of 2005 and reached Martian orbit in March 2006.